Extend your students word knowledge through Word Study by refocusing instruction on spelling patterns, rather than rote memorization of word lists. Word study provides students with opportunities to investigate and understand words that are based on a specific pattern. Knowledge of these patterns will allow students to better recognize and apply word knowledge to their reading and writing. Based on your students’ spelling knowledge, assign a required word list or a suggested word list that provides examples of words that are appropriate for their stage of spelling development. Two styles of editable spelling templates are included, which allow you to customize: spelling pattern title, spelling pattern review, spelling words, challenge words. The spelling contract provides opportunities for students to generate additional words within a specific spelling pattern. It is also designed to align with differentiated spelling lists so that students are learning words appropriate to their stage of spelling development. Premade and editable contracts are included. 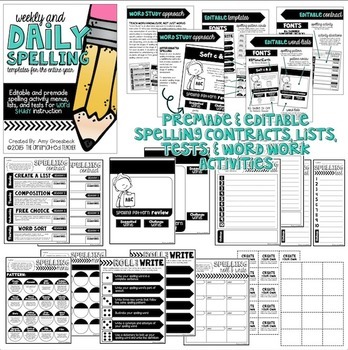 The Spelling Menu and Spelling Roll and Write activities allow students to experience hands-on spelling practice and can serve as a set of learning stations during Reading or Writing Workshop. Each activity provides students the opportunity to participate in multiple tasks that allow them to demonstrate and extend their learning of word knowledge. 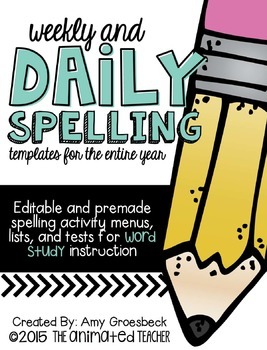 Premade and editable word work activities are included. Students’ independent writing samples can be used an authentic spelling assessment. Two spelling test templates are included so students can compose a piece of writing (or sentences) that incorporates words and word patterns that were taught during a word study. A third, traditional spelling test template is also included for students with accommodations.